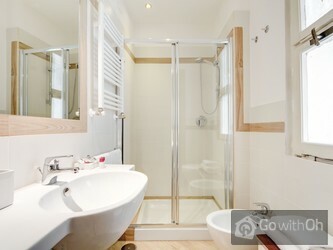 This apartment was refurbished in 2012 and has been decorated with taste and attention to detail. The property features parquet flooring throughout, which together with the different colour schemes in each of the rooms makes the apartment one of a kind. 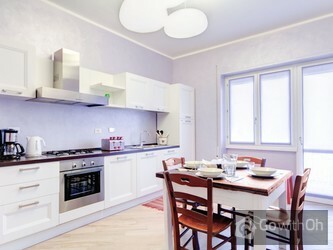 The 100m2 apartment is designed to comfortably accommodate up to 6 people. The apartment is situated on the third floor of a beautiful building with a lift. The courtyard is modern and has been decorated with a design that will catch your eye. A hallway connects all of the rooms. The living room is the heart of the apartment and is where you can relax and unwind on the comfortable sofa-bed and enjoy the LCD television. 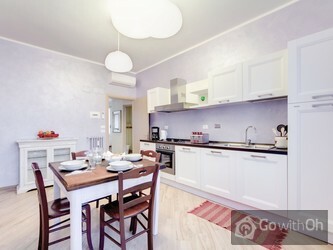 The well-equipped kitchen features a dining table and chairs. From the living room and the kitchen you can access the balcony through the patio doors. The two bedrooms are very spacious and feature double beds with memory foam mattresses and en suite bathrooms with showers. 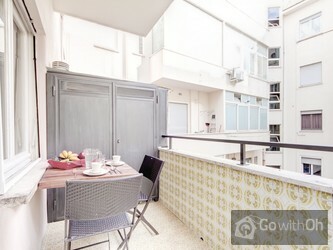 One of the bedrooms also features a small balcony with a table and chairs. The property houses another two bathrooms, one with a bathtub and the other with a shower. You will also have a Wi-Fi internet connection at your disposal. Late check-in between 22:00 and 01:00 available for a supplement of 25. Cot available on request at no extra cost. The availability of the above mentioned equipment must be confirmed directly with the owner prior to the arrival date, otherwise the availability cannot be guaranteed. Lo mejor de Europa. Departamento nuevo, limpio, amplio, vajilla completisima, computadora, ammenities de categoría, electrodomesticos de toda clase, juegos de jardín en los balcones, depto muy luminoso en un barrio tranquilo y lindo. Había hasta botiquín de primeros auxilios! Importante: nos ...dieron 3 juegos de llaves, indispensable cuando viajan varias personas. El dueño del piso nos dio un trato excelente, dándonos incluso recomendaciones de supermercados , pizzerías, etc de la zona del apartamento, el apartamento genial, igual que en las fotos de oh- Rome. Cher Client, Léquipe dOh vous remercie pour votre commentaire. Nous vous confirmons avoir actualisé linformation du site web en retirant le microonde de la liste des équipements. Limpieza. Espacioso. Luminoso. Como en casa!! Great area. Lovely decor. Helpful owners. Es un excelente apartamento, limpio y cómodo y bien equipado. Excelente ubicación y excelente la atención y las recomendaciones de F, su dueño. Disfrutamos la estadía!. nice and clean flat, very helpful contact person, perfect location. Enough room (and bathrooms!) for up to six guests. lovely, clean, large rooms. Helpful staff - had a great stay! Es war alles wunderbar. Gerne wieder. Apartment bit more worn than in the pictures. Check in was very smooth. Great just stayed here in April 2016 for short family holiday and would highly recommend for family or couples. 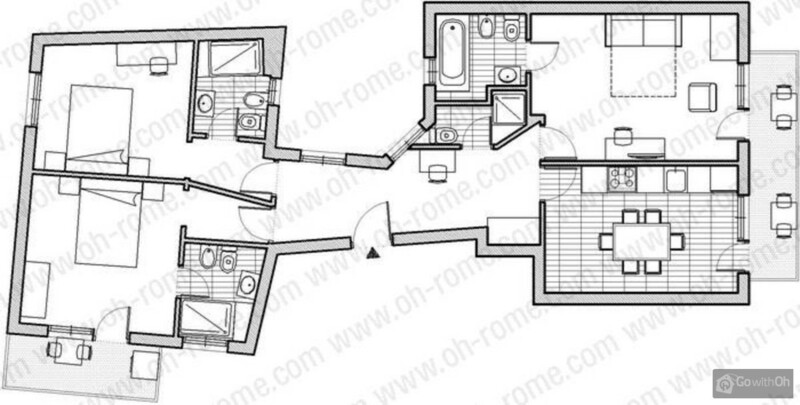 This is a very spacious, quiet and comfortable base to explore Rome. We had a really friendly welcome on arrival with useful local recommendations. The standard of finish and cleanliness is excellent. This is the second time that I have stayed in this apartment. It is furnished very nicely and a great location. Several great restaurants just a couple of blocks from the apartment. 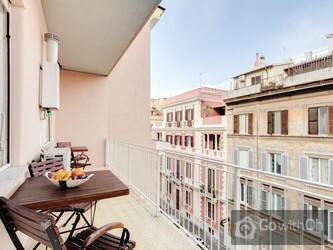 Hopefully I will return to Rome again one day and I will try to stay in this same apartment.